**New for 2018-2019. The Schwinn 270 Recumbent Exercise Bike is Schwinn’s top home recumbent exercise bike. A mid priced home bike with many features and solid quality. Recumbent bikes have back support, and are easier to mount. The Schwinn 270 will provide a low impact cardiovascular workout with low impact on your joints. The Schwinn brand of bikes is a well known brand going back to 1895. The Schwinn MY17 270 features a balanced flywheel, which creates a secure, quiet, vibration-free workout, as well as 25 levels of ECB magnetic resistance. ECB is the best type and quiet form of magnetic resistance. There are 10 resistance quick keys to go from easy to hard. 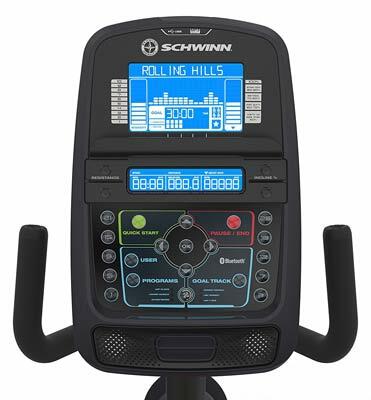 Schwinn provides 29 programs (12 Profile; 9 are Heart rate control; 4 are Custom user defined; 2 are Fitness tests; 1 Recovery; and 1 Quick start) and additional features. The walk-through frame gives you easy access to mount and dismount. The two integrated levelers & the large mid-frame support give you a solid and stable bike platform. 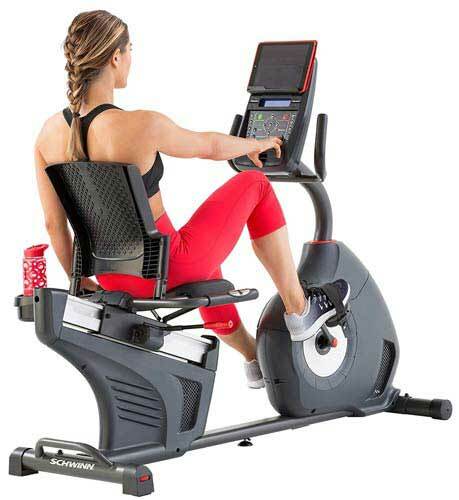 Schwinn 270 Recumbent Bike Features: Schwinn DualTrack™ two LCD window system allows you to watch up to 13 different display feedbacks. The LCD screen has a Blue Backlight for easy viewing. Keep track of your progress and download the data to a USB drive with the Schwinn Connect™ website. Integrated Speakers sound system for listening to your iPod or MP3 player while you exercise. Pulse grip heart rate monitoring (optional heart strap). 3 Speed Workout Fan (keeps you cool during your workout). Bluetooth® connectivity, will sync with your Schwinn Trainer App and other apps for fitness tracking. Smart-Review Commentary: The Schwinn 270 exercise bike is an excellent low priced recumbent bike for home use. It is Schwinn’s top of the line recumbent model. This model should fit most needs as its maximum user weight is 300 lbs. It is loaded with convenience features, and comfort features (cooling fans, stereo speakers, side water bottle holder). The 270 model has a backlit LCD display for better visibility. This model has heart rate grips, and is Telemetry heart rate enabled (chest strap not included). Bluetooth® connectivity allows you to sync with Schwinn Apps on your tablet or smartphone. The frame is built for added stability. Toe straps are included. This model has a very good warranty as well. The Schwinn 270 received very good consumer reviews and has won our BEST of 2019 Award for recumbent exercise bikes. Description: The Schwinn 270 recumbent exercise bike is highly rated, with many high end features. The 270 bike uses 25 levels of ECB magnetic resistance for smooth, quiet, and maintenance free resistance. Premium features include 29 workout programs, backlit dual LCD screen, heart telemetry, built in Bluetooth®, and a 3-speed fan. User weight up to 300 pounds. This model is a SmartReview Top Pick.